The item A reindeer's first christmas/new friends for christmas, Tish Rabe, (ebook.) represents a specific, individual, material embodiment of a distinct intellectual or artistic creation found in Charlotte Mecklenburg Library. Fans of the Cat in the Hat have cause to celebrate this holiday season with two stories based on the one-hour PBS Kids' primetime special The Cat in the Hat Knows a Lot About Christmas! 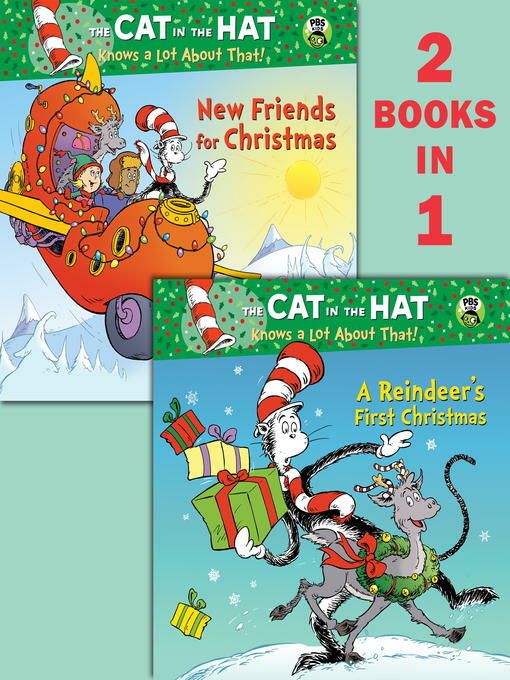 In A Reindeer's First Christmas, narrator Ralph--a yearling caribou--tells how but for the help of the Cat in the Hat, Sally, Nick, and some new friends, he narrowly misses spending his first Christmas at home and pulling Santa's sled! And in New Friends for Christmas, Sally and Nick learn that with a little help from family and friends--and a spare mini Thinga-ma-jigger--its possible to accomplish almost anything!